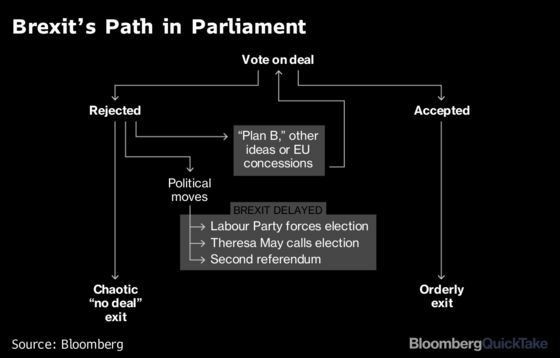 (Bloomberg) -- Today in Brexit: It’s all about just how bad is the defeat for May’s Brexit deal. Prime Minister Theresa May’s Brexit accord goes to Parliament at last on Tuesday for a vote she can’t hope to win. Instead, it’s become an exercise in gauging just how dead her deal is, and what the way out of the impasse might be. Pound traders reckon 100 is the magic number: If she’s defeated by fewer than 100 votes the market would expect her to bring the deal back to Parliament for a second vote; more than 100 would send sterling lower. European Union diplomats have their own measure: A margin of less than 60 would be grounds for hope, and the bloc may look at new ways of making the accord more palatable to get it across the line. Faced with a defeat that could mark a historic record, May pleaded with members of Parliament on Monday to reconsider their opposition to her deal, as the EU’s effort to help make the agreement less divisive — a letter setting out some assurances on the much-loathed Irish backstop — fell flat. She asked lawmakers to think of the history books, and not to betray the British people. May says that maneuvering in recent days by pro-EU members of Parliament means it’s now more likely that Brexit will be thwarted than it is that Britain will tumble out of the bloc without a deal. There was more jockeying on Monday as MPs Dominic Grieve and Nick Boles set out plans to force the government to maintain close ties to the EU or even hold a second referendum. Watch out for more attempts to change May’s Brexit policy with amendments on Tuesday. There could be government-friendly amendments,too. One plan that was floated on Monday by a Tory MP would call for a time limit to be included in the Irish backstop. May fought to get such a clause included during negotiations but failed. The government was considering backing the amendment on Monday, even though doing so would mean that what lawmakers finally vote on would not be the withdrawal deal as negotiated. It would, however, give May something clear to ask for when she heads back to Brussels to seek more concessions. May is expected to speak after the vote on Tuesday night. She has until Jan. 21 to come back to Parliament with a plan B, but the pressure will be on to say something sooner. Her options? Seek more from Brussels; put the deal back to Parliament; ask for a delay to exit day and try a new approach; let Parliament take control; or call a general election. But before she does any of those, she may have a vote of no-confidence to deal with if Labour leader Jeremy Corbyn decides — at last — that now is his moment to try to bring down her government. ICYMI: If May Can’t Win Her Brexit Vote, What Other Options Are There? Merkel’s Concession? 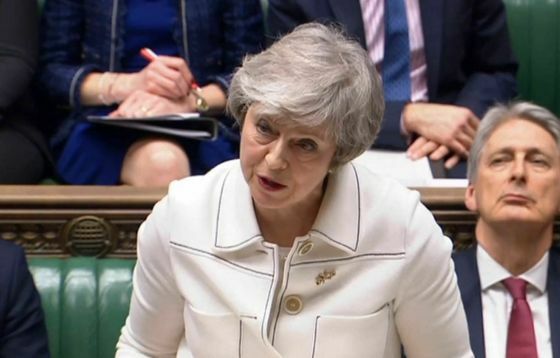 | Theresa May is planning for a second vote on her Brexit deal after German Chancellor Angela Merkel suggested the EU could grant extra concessions if MPs reject the current plan, the Sun reported. Concessions could include persuading Irish Prime Minister Leo Varadkar to agree to an end date for the Irish backstop. Whip Resigns | Gareth Johnson, a Tory whip, resigned because he can’t back May’s Brexit deal, in particular the backstop. Not Very Reassuring | The EU sent May a letter setting out long-awaited assurances on the most toxic part of the Brexit deal, the Irish backstop. But the bloc refused to include an end-date for the backstop as May had wanted and merely reiterated that if the arrangement is used it will be temporary. Buy Gold | Brexit is making people buy gold, according to the Royal Mint. Sales in December jumped 17 percent from a year earlier, and the day after May pulled the vote on her Brexit deal, they spiked 74 percent. On the Markets | How will the pound react to the vote? Mizuho Bank reckons that if May loses by a margin of more than 220 the pound could fall to $1.225. If she loses by 100 votes or less, the deal has a chance in a second ballot, and if she loses by just 20 votes — which looks unlikely — sterling could rally to $1.350. The pound traded at $1.2902 early on Tuesday. Not So Fast | Thinking of sending money out of the country on Tuesday? It may not be so easy. Foreign-exchange broker TransferWise is to cap transfers to and from the U.K. at £10,000, compared with its usual £1 million limit, for 24 hours around Tuesday’s Brexit deal vote. “Extreme currency volatility can impact the service we’re able to offer,” a spokesperson said. Accidentally on Purpose? | Another government official has been snapped with his notes on show in public. But this time the brief — on no-deal planning — was so clearly on display it prompted accusations of being staged. Mel Stride, the financial secretary to the Treasury, carried papers that read: “1: No Food. 2: No Channel Tunnel,” according to the Mirror. Project Fear getting desperate?